and left fermenting inside the warm barrel of the earth. immersed, creating nests away from harm in long bush grass. All this richness soon will pass, be lost, is already past, has gone. round of intrepid roots and sprouts, fiery heart- and limb-buds. decay compose thick cud of sleep and the dark prayer of oil. Dawn Garisch has had three youth novels, two adult novels, a poetry collection and adult literacy books published. She has had a short play and a short film produced, and has written for newspapers and television. 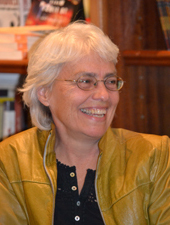 Three of her novels have been published in the UK. She has completed a memoir, Eloquent Body, which examines the split in her working life – writing and doctoring – and how science and art perceive the truth differently. She argues that both established fact and personal symbol are necessary to understand one's life. This was published by Modjaji Books this year. Awards and grants include an Avanti Award for a documentary script 'Dancing With The Ancestors', a DALRO award for poetry, and an ANFASA and NAC grant to complete 'Words and Flesh'. Her latest novel, Trespass, was nominated for the Commonwealth prize in Africa.